Fundraiser for Randy Ellis by Amy Yates Wuelfing : Save the 'Cave! Randy Now is a very important person in my life. Two years ago I published No Slam Dancing, No Stage Diving, No Spikes, an oral history of 80’s-era alternative and punk rock music told through the portal of one club—Trenton, New Jersey’s legendary City Gardens. The book revolves around the one man responsible for putting City Gardens on the map - DJ and promoter Randy “Now” Ellis. He discovered new acts, booked bands, promoted the shows and—when need be—acted as host, security guard, bouncer, bartender, bus driver and babysitter. Randy has spent over 30 years in the music business booking bands, promoting shows and acting as a tastemaker. He has worked with some of the most prominent names in alternative music including The Ramones, The Replacements, Nirvana, REM and New Order. Because of his love for music, Randy has always been a promoter and champion of underground music. He books and promotes shows to this day and is still in touch with many of the bands he worked with in the 80’s and 90’s. This fundraiser to get Randy over the hump so he can continue to keep the store open, hold concerts, book signings, and other events, and keep the punk rock ethos alive and well in New Jersey. We have some fun and creative rewards, so please help us any way you can! Everyone - Randy wants to thank everyone who donated from the bottom of his heart! It's like Christmas came early! Randy will also be appearing with my co-author Steven and me at the Trenton Library on October 22 at 2PM so drop by and he can thank you in person. Randy was also contacted by a gentleman from the Mid-Atlantic Popular Culture Association (MAPACA). The are holding a conference on November 3-5, 2016 in Atlantic City. Randy is receiving the Divine Impact Award for being an individual who has had an impact on local and nation-wide culture!! So things are looking up! All this positive energy has really lifted his spirits - and knowing how many people care about him. Peace and blessings for everyone! 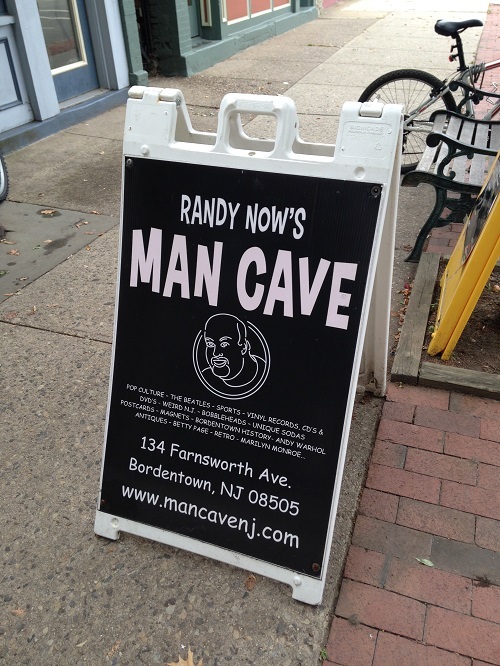 Yesterday Randy's celebrated his 60th birthday at the Mancave. A good time was had by all. Today, he is in surgery getting his cataracts fixed. Thank you to everyone who has helped with this campaign! Randy appreciates each and every person who has helped out. It's wonderful to see all the great times he has given us over the years aren't forgotten. Update from Randy: I am so shocked, and of course happy, that so many people have shown an interest and genuinely care for The Man Cave Store's survival. I am overwhelmed and short on words right now, but it can be summed up with a heartfelt THANK YOU for everyone's involvement and support. You have to love this reason for giving to SAVE THE CAVE. City Gardens bouncer TODD LINN - "" Here is the money for those two girls I let into a Ramones show in 1988"" LOL ! Thanks for setting this up, Amy! Come to the Mancave and break a 78rpm record over Randy’s head. You can even film it! Come to the Mancave and pick two exotic sodas of your choice, and BS with Randy. Come to the Mancave and pick two exotic sodas of your choice, and BS with Randy, and get a FREE City Gardens pint glass! Come to the Mancave and pick two exotic sodas of your choice, and BS with Randy, and get a FREE one pound tin of Charles Chips! A 30-minute tour of Bordentown, guided by Randy. A first-edition of No Slam Dancing, signed by both authors and Randy. Dinner with Randy at the Wisdom Dinner in Bordentown, NJ! Donate $3000 and receive Randy's mint 1977 Volkswagen Beetle! Lets keep the Man-Cave open! From the Major Thinkers at City Gardens in 1980 to Peter Pumpkinhead at Hope Hose Firehouse this year, Randy has given me the opportunity to witness many a great live show. To him, I am greatly appreciative. Here's to a great guy and a friend. Hope this helps you keep doing the things you do for as long as you want to do them. Thanks for your help Randy! Great new Randy that you are able to continue your passion and share your talents with out town. Properly fueled will be opening soon and I e got some great ideas that we mights want to collaborate on together. Looking forward to sticking together to keep Bordentown moving forward.